Gotta love this poster from Ellis Clark's Facebook page. Several bands in Peoria will gather together on February 9th for It Was 50 Years Ago Today Sgt. Pepper Taught The Band To Play - A Celebration Of The Beatles Debut In America. Organizer/musician Craig Moore promises, “surprise performances, orchestrated Beatles material you rarely hear performed live, videos, special guests, and more.” The musicians will be donating their time so that proceeds can go to charities like Illinois Dream Factory, which helps chronically ill children, St. Jude’s Hospital, and the Washington Illinois High School Tornado Relief Fund. It Was 50, etc will take place at 8102 N.University in Peoria. Moore suggests listening to Peoria station WWCT - FM 99.9 throughout January for details. 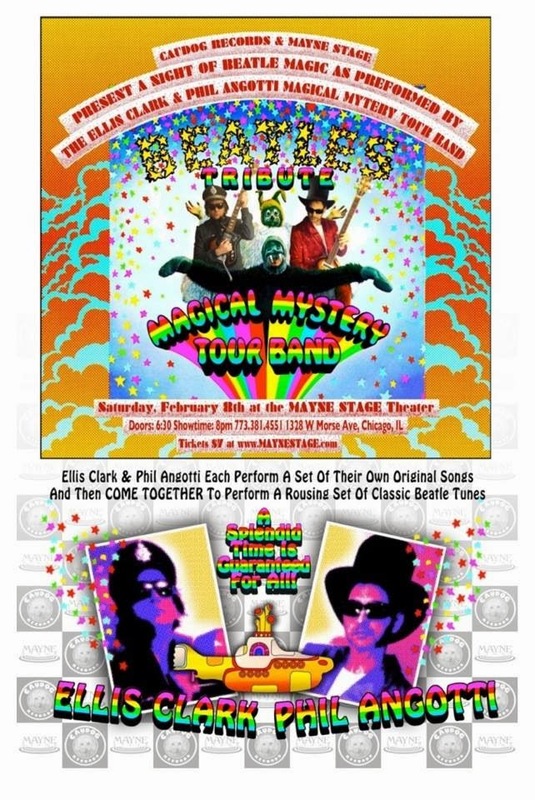 Phil Angotti and Ellis Clark will also be marking the 50 Anniversary of The Beatles coming to America, with their Magical Mystery Tour Orchestra at Mayne Stage on Chicago’s north side on February 8th. Each singer-songwriter will do a set of his original material, and then Angotti and Clark will combine forces on a set of Beatles songs, backed by a full band. Tickets are $7. In the meantime, Angotti has a show with Steve Dawson of Dolly Varden next Friday, January 24th at FitzGerald’s in Berwyn. Mike Cohen and Jeff Janulis of The Abbeys will be doing a 45-minute acoustic set (possibly joined by their bassist Carl Lubicz) as part of an Americana/Indie showcase next Friday at Reggie’s Music Joint on State Street. The Harmaleighs and Jukebox Casanova are also on the bill. The new full lineup for The Abbeys will make its debut at Redline Tap on February 15th. There’s going to be an event called Big Silly Variety Show & Party next Saturday, January 25th at the Park Ridge VFW Hall, but other than one of the acts being named Crapalanche, I don’t see anything silly about it. Still, you could definitely party with Crapalanche, along with Paul Coady And The Edsel Bros., The Tulips, Dan Connolly, Go Time!, Robin And Jerry Bienemann, Wango City, and singer-guitarist Kent Rose. The Park Ridge VFW Hall is located at 10 Higgins Road, and the silliness starts at 7:00PM. Chicago Comic And Entertainment Expo returns to McCormick Place on the weekend of April 25-27, but artists and people who dig wearing super hero costumes can get an early start next Thursday, January 23rd. That’s when C2E2 will present the first installment of Heroes & Villains at Lincoln Tap Room. Comic guests Jenny Frison, Mike Norton, and Tim Seeley will be providing prizes for a hero-themed drawing competition. Feathers have followed up their debut If All Here Now with a four-song EP titled Only One. It features two new tracks,“Wild Love” and “Only One” along with a pair of remixed songs from their first release. The Austin, Texas-based band is currently on tour with Depeche Mode in Europe. Chicago’s inventive techno band Save The Clocktower will be performing an all-ages show with Bad Veins at Beat Kitchen next Saturday, January 25th. They'll also be at Durty Nellie’s in my hometown of Palatine on February 27th and at The Hideout in Chicago on February 28th. These Boots Are Made For Playing “Barracuda.” If I had enough room in my closet-sized media room, and more spending cash, I would bid on eBay for Nancy Wilson from Heart’s boots. It’s part of the 6th Annual Kick Up Your Heels Fundraiser for the Lancaster Opera House. The current high bid is $1,000. If Only I Could Remember My Nickname. David Crosby has sold out his two upcoming gigs at City Winery in Chicago, and has a new CD titled Croz on the way. If you’ve read Graham Nash’s new autobiography Wild Tales, you might have noticed that Nash usually refers to his buddy and band mate as ‘Croz’ when he’s writing about something positive, and as ‘Crosby’ when he’s describing bad behavior. Long live ‘Croz’! Power pop aficionado and Secret Weapon podcast creator “Boris” Boden has a guest post on the Meanwhile Back In Peoria blog, where he talks about Jerry Seinfeld’s Comedians In Cars Getting Coffee Internet series, and posts some artful photos of snow-flected vintage cars. Thanks for the MBIP and "Boris" shoutout! 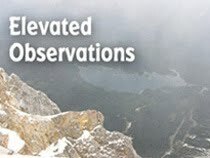 "Boris" posts every other Saturday, so stay tuned for more in the future! Crapalanch has never sounded smoother. This Show is gonna be non squatting kind of show.